Here we have a meal which is suspiciously similar in both method and look to last night’s offering (Vegetable Enchiladas); not in taste though! 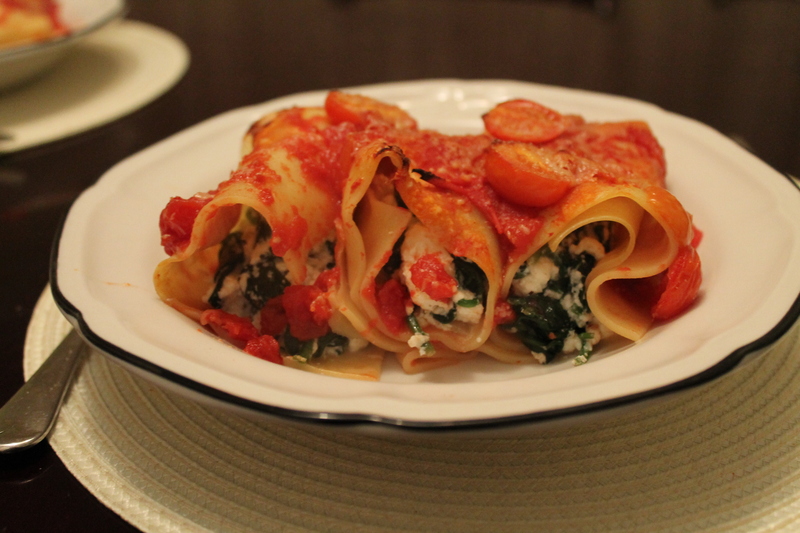 It also bears a significant resemblance to my Spinach, Tomato and Goats Cheese Cannelloni – however, I’ve gone for ricotta over goats cheese because I fancied the softer, more delicate taste tonight as opposed to tangy goats cheese. I’ve made this for two reasons – 1. it snowed a bit and it was cold so I needed comfort food. The snow is gone now, as though it were never here, but I still want the cannelloni. 2. My husband was supposed to go and pick up a new car, but because of the aforementioned snow cancelled his collection, so I wanted to make something to cheer him up (unbeknown to me, the collection was later reinstated, so now we are having it for a third reason – to celebrate the arrival of the brand new car). 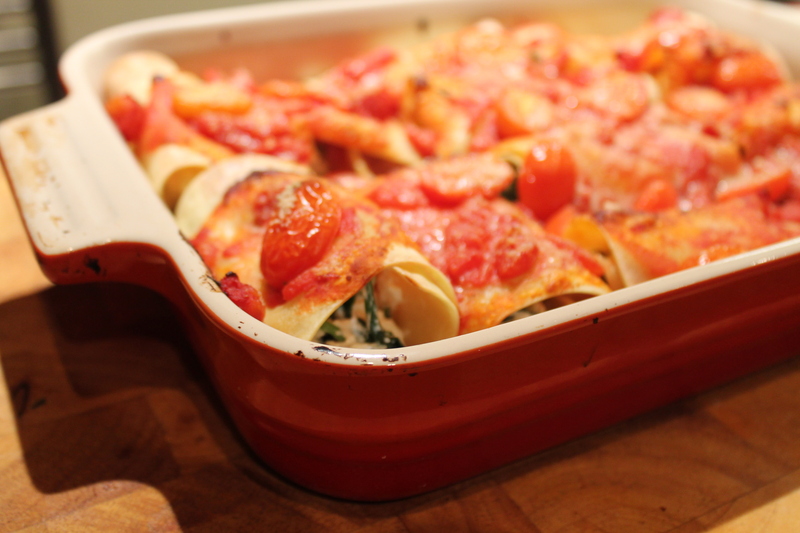 Anyway, back to the recipe – give it a go; it is desperately straightforward and the use of fresh lasagne sheets rather than dried cannelloni tubes also makes it surprisingly fast to make. What’s not to like? This will serve 4, and takes 40 minutes to make. 2. Chop the onion and add to a frying/saute pan with the olive oil. Saute for 1-2 minutes, then gradually add the spinach until it is all completely wilted. Stir in the nutmeg and a little salt and pepper. Leave to cool for 3-4 minutes. 3. Break up the ricotta in a large bowl, and stir in the spinach. Take your fresh lasagne sheets one at a time, and lay a large spoonful of the ricotta mix along one end of the lasagne. Roll it up around the ricotta, then lay in a large oven proof dish. Repeat for the rest of the lasagne sheets. 4. 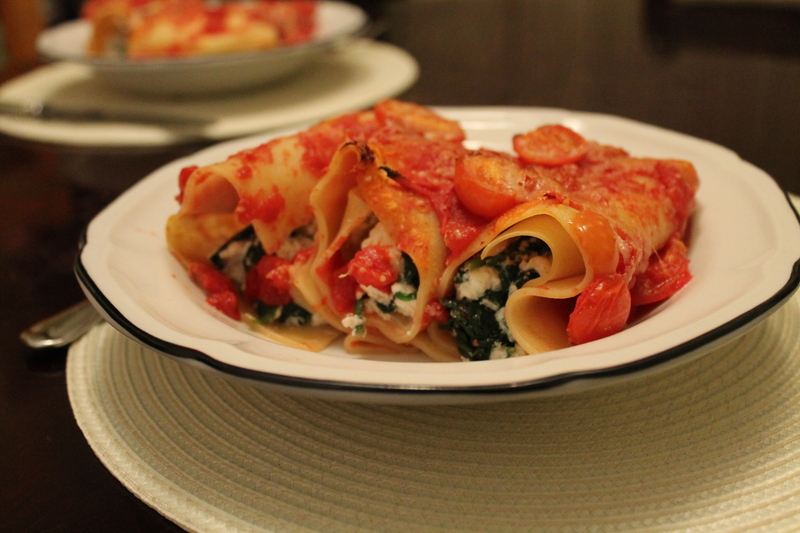 Pour the chopped tomatoes evenly over the cannelloni (you probably won’t cover them completely, but that’s fine. Sprinkle over the halved cherry tomatoes and grated parmesan. 5. Bake in the oven for 20-30 minutes, until the pasta is cooked and the parmesan is golden. Harriet how ingenious of you using lasagne for cannelloni . . . I think I might have to borrow that idea to please my son who is always asking for pasta in different forms. 🙂 I don’t yet have a spinach recipe on my blog http://www.LifeDietHealth.wordpress.com but this has reminded me again how much I love spinach (especially with nutmeg). Ooo. . . new car! 🙂 Enjoy! Thanks, it was really tasty and so easy too! This looks great! I like how you used cherry tomatoes on top versus just tomato sauce. Corr, comfort food indeed! Love the look of those rolls of pasta, it makes me want to dive in! Haha, that’s the problem isn’t it – you just want to tuck in! This looks delicious! I will have to give this a try. Congrats on the new car! Thanks Carolyn. The car is brilliant, we didn’t have one at all before so it’s making a big difference! This looks great! Maybe we should team up with some food ideas!! Great idea! Your blog is fab too – so readable! well let me know what ideas you may have, and I will get some together. I am excited!!! Give them a go – I’d love to hear how you get on! A lovely recipe, such a classic combination that really works. What a great idea!!! Lasagna sheets to make cannelloni!!! You should’ve seen my face when I read it…. Thanks for the idea, definitely gonna try it. Thanks Adriana – I’m glad you like the idea! Fabulous dish for diner! I’ll just change ricotta for goat cheese, do you think it can be nice?